Create videos for life's precious moments. Premium featured plans start at just $4.99 a month. WeVideo is the online video editor that makes it easy to quickly create stunning videos to preserve and share all of life's special moments. Effortlessly combine your favorite video clips, special photos and sound to create unique shareable movies of special moments that will last a lifetime. Create and share anywhere at anytime, from the beach to the family room, with access to your WeVideo account from your favorite browser or mobile devices. WeVideo gives you unlimited creative control so your video memories are as unique as your family and friends. Think big! Complete your story with personalized graphics, text and narration. With special effects, audio editing and Hollywood-style features like green screen and picture-in-picture, your biggest ideas are always in reach. Friends and family will be stunned when you post pro-grade HD and 4K video to popular sites like Vimeo, YouTube, Facebook and Twitter. Or download a 4K video and impress everyone on the big screen. WeVideo is completely Cloud-based so there’s nothing to install, no complex, expensive hardware to buy, and you always have massive video processing power on pretty much every Windows and Mac laptop or desktop, even Chromebooks. Create your vacation video while still on the road. Our mobile video editing apps for iOS and Android let you produce your video in minutes from anywhere. Projects sync in the cloud so that you can seamlessly pick up right where you left off. Check out WeVideo for free or dive into Power, Unlimited or Flex to start your blockbuster with top-notch features like green screen, screencasting and picture-in-picture. Ready to take your videos to the next level? Never pay for stock again. 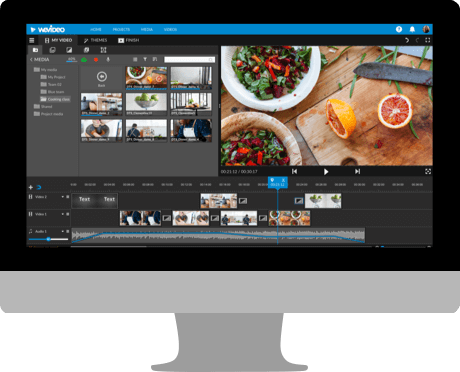 With WeVideo Essentials™, you have unlimited use of 1 million licensed and royalty-free video clips, images and music tracks—everything you need to create pro-looking videos in minutes, at your fingertips. Included at no added cost in all WeVideo business subscriptions.